I get married in 8 months and am starting to think about hairstyles and whether to have a tiara or headband....the thing is I'm not sure how I want my hair. I have quite fine hair so am thinking of wearing my extensions to make my hair a little thicker and longer. Ideally I want something soft and princess-like and either all down or half-up, half-down. I'm planning on wearing my hair down or half up/half down because I wear my hair up so much! I'm planning to get some extentions for volume nearer the time. My hairdresser has said to wait until I get the dress because that could dictate how I want to wear my hair. Eg if there are straps or detail I might decide on putting my hair up and out the way. He also said if the wedding starts early he always suggests an updo so the hair hasn't dropped by the evening do, but our wedding isn't until 5pm so I think I'll be ok! In the meantime I'm collecting images of 'hair inspiration'. 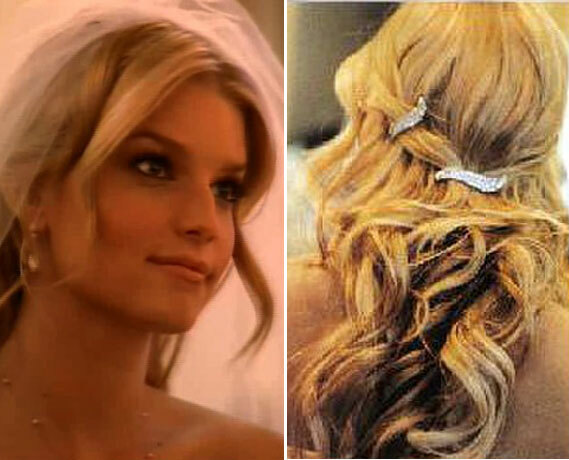 This is my favourite so far (Jessica Simpson) as I am also planning on getting some nice clips for my hair. If you save up some images you'll see a theme forming and you can take them along to give your hairdresser some ideas. If you need any tiara or clip inspiration there's a site called Glitzy Secrets who do lovely pieces. Wow you're hair looks BEAUTIFUL!!!!!!!!!!!!!!!!!!!!!!!! !